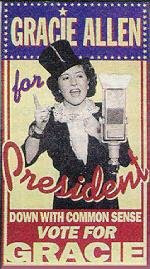 Molly McGee has decided to support her friend Gracie Allen this election year. Read all about her 1940 Presidential run on Wistful Vista. You can also get birthday present ideas for Molly - how very efficient! On a side note, I've created a new blog. This one is quite a simple, and if I do say so myself, lovely little blog. I hope you will find things to contribute there. "If the country's going Gracie, so can you." "Down with common sense?" It could apply to so many. Your blog is smokin' hot!